now that I recognize that we've adopted, or rather, the groundhog has adopted us. Because of our new stubborn addition to the family, I'm not sure if I'll be able to have any tomatoes other than grapes and cherries for the event. He seems to have an appetite worse than a teenager and as destructive as a toddler plus he's magnitudes stronger. I have yet to meet him since he keeps odd hours, so I guess he's like a college student in that way. Regardless, I do wish he'd at least clean up after himself. Heck, he could even be a she. Get a trap and put in some melon. Sure thing to trap the little thief. Then do what you wish....relocation is the second best option. They are cute on groundhog day, but that's about it. Whistlepig Relocation Program. Worked for me. Last edited by tomatoguy; August 23, 2008 at 09:17 PM. Nice to know that melon works for 'chucks. We keep an unbaited live trap sitting along side the house or garden fence. For some reason animals are attracted to it and just walk in. 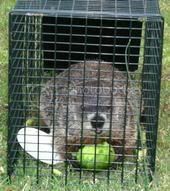 We usually get young groundhogs, racoons, and possums. Last week alone we got two white rabbits (the neighbors let their 4-5 pet rabbits wander loose) and two skunks. Up in northeastern Tennessee and Southwestern Virginia, we hunted them when I was a kid. They really like apples. You might try a small fruit and veg salad and the little cutey will probably trap itself quickly. If you have one, you might check around the area. They rarely come in singles. I keep all 4 legged critters away with a product called "Repels All". A few sprays on objects to establish a perimeter, and the squirrels and even the neighbor's cat keep their distance. Hmm. I wonder if Repels All would work for moose! Sherry have you tried the stuff these guys talked about. Just wondering as I have deer. I feel for you! I have evil rabbits and squirrels that like to do havoc to the garden. You should see Gary with the bb gun. He looks like an over grown Elmer Fudd. And don't worry if all you don't have much! I think you know we'll have more than enough tomatoes to taste. Your company is much more important . I love the photo with the melon btw. Oh, I tried Repel All and a pepper concoction, and the little booger broke through the perimeter. However, they successfully kept DH away when he was in town. Oh, I should be able to bring Roma Cherry (grape), Snow White Cherry and Pineapple Tomatillo/Ground Cherry Husk. Maybe Amish Paste, Opalka, and a couple of others. I was really hoping to have Mr. Bruno, the critter's been snagging these though. I received Mr Bruno seeds from BillP in TX. Worth -- We haven't tried it yet, but we did buy some this year. We were going to spray it on the new cherry trees, but decided to build cages instead. So we have some on hand just in case. I got it at WalMart, but I've seen it at other stores too. It's pretty pricey, but cheaper than replacing a cherry tree!